Sometimes charts tell a story that is not entirely obvious. And since everyone is focused on Europe, here is a chart of the Credit Suisse Western European High Yield Index, tracking non-investment grade bonds of companies in Europe. 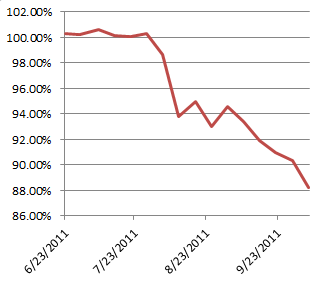 Instead of the index returns however, the chart shows the average duration of bonds that are part of the index. 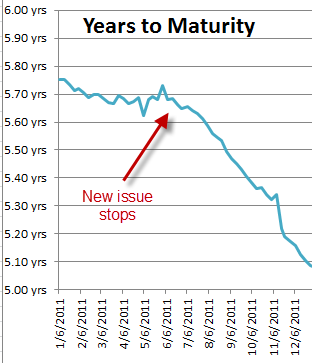 Why would the duration of European bonds increase through August and then start dropping off? Let's first address the increase. 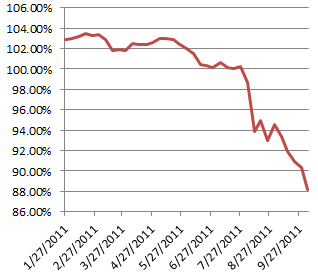 The chart below shows the average bond price in the index as percent of par. 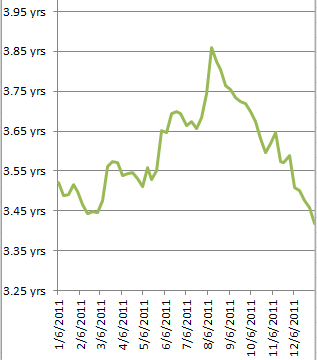 Bonds traded at a 2-3% premium to par early in the year but started selling off in May. About 35% of these bonds were trading to a "call date" rather than to maturity early in the year. That means that just like a mortgage, when the yields were low (and prices high), these bonds were expected to be refinanced before maturity by the borrowers. As the selloff started last summer, yields rose and refinancing didn't make sense any more (just like when rates rise significantly, it makes no sense to refinance a mortgage.) 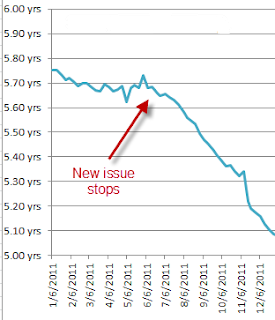 Thus durations on these bonds extended, increasing the average duration on the index. Now the question is why did durations start shortening in August? The answer is quite simple, yet telling. 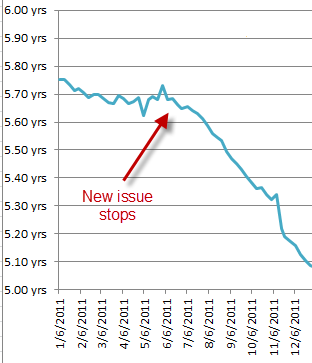 High Yield new issue came to a grinding halt in Europe. The primary markets effectively shut down. And now time took over, and as time went on, maturities got shorter and so did durations. And there was no new longer duration paper to add to the index to keep the duration constant. The next chart shows average years to maturity of the CS Western European HY Index. As the average maturity became shorter with time, so did the durations. Also some bond prices came up slightly at the end of the year and a few bonds started trading to call dates again, shortening durations further (slight reversal of what happened in part one). Whether this market opens up again remains a big question. With some sovereign bonds trading at HY levels, the corporate yields would need to be really high or the firms really strong to attract buyers. In the mean time durations in Europe will continue declining.